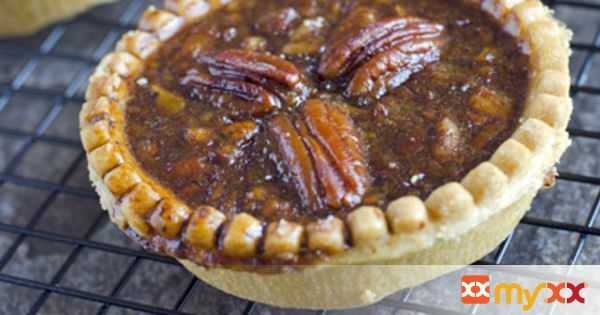 These tiny tartlets are a chocolate-chip twist on the classic pecan pie. Top with shaved chocolate or chocolate-dipped pecan halves for an added chocolate fix. 1. Preheat oven to 350°F. Place tartlet crusts on a large baking sheet. Bake partially for 10 minutes. 2. In double boiler, melt the butter with the chocolate chips; set aside. 3. In a large bowl, beat the eggs, then add brown sugar, corn syrup, vanilla and salt. Add the butter-chocolate mixture; blend. Stir in chopped pecans. Pour filling into partially baked crusts. 4. Bake for 20 to 25 minutes, or until crust is golden and center of tartlet is set. If desired, decorate as suggested with chocolate shavings or chocolate-dipped pecan halves. 5. Cooking Tip: To prepare chocolate shavings, simply cut or "peel" a milk chocolate candy bar with an ordinary potato peeler! Melt remaining chocolate and dip pecan halves to use as additional garnish.